Every time this hair style shows up in pictures I get requests for a tutorial. She who asks long enough and politely enough just might eventually receive whenever I stop being lazy for a few minutes. 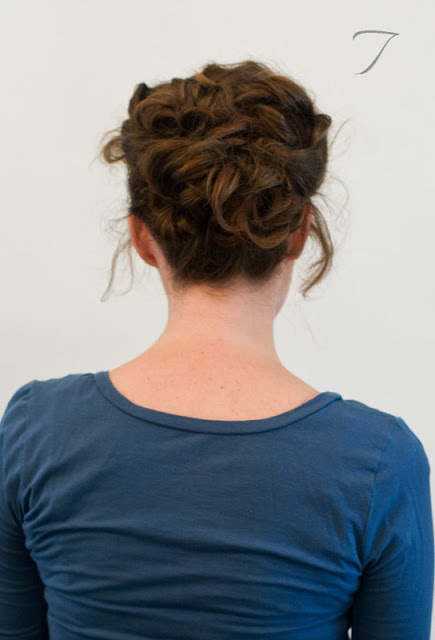 I've always envied those effortless, romantic updos that curly girls can do with just a few pins. The look is so soft and feminine and slightly undone and my stick straight hair just couldn't come close. Then I discovered cloth rollers in high school and this has been a favorite style of mine ever since. Cloth rollers * are easiest but they're not a requirement. 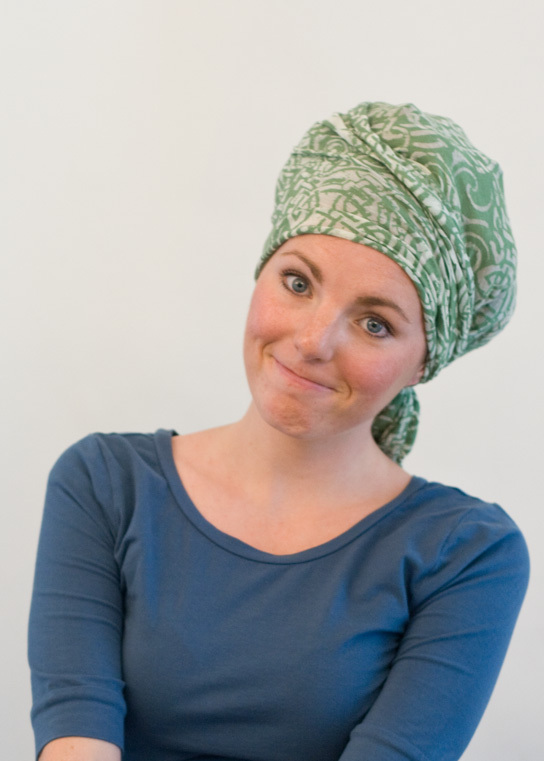 You can do rag curls instead and it will work fine but you want to make sure you roll all the way to your roots (instead of stopping at the ears, which is what a lot of tutorials have you do). 1. Start with very slightly damp hair. I usually shower at night, do a good allover spritzing with my sea salt spray (gives texture and helps my curls hold longer) then blow dry a bit and let it air dry some more while I finish getting ready for bed. 2. 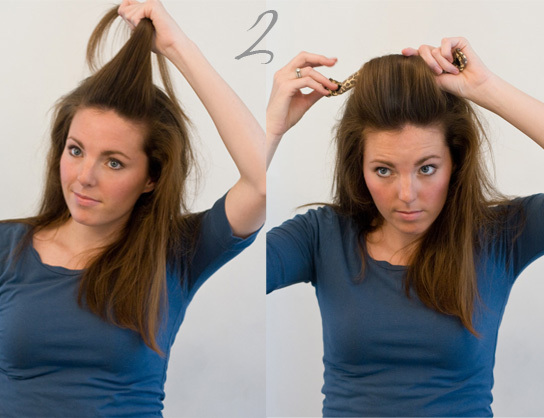 Pull a 1-2 inch deep section from the front of your hair and roll it with a cloth roller (or with a strip of fabric). Pull out the section behind it and roll. Continue down the center of your head (think skunk stripe). This may take a few tries. I've gotten really fast at it but I've also been doing it for about 10 years. 3. Repeat on the sides. Pause to admire the hotness. 4. 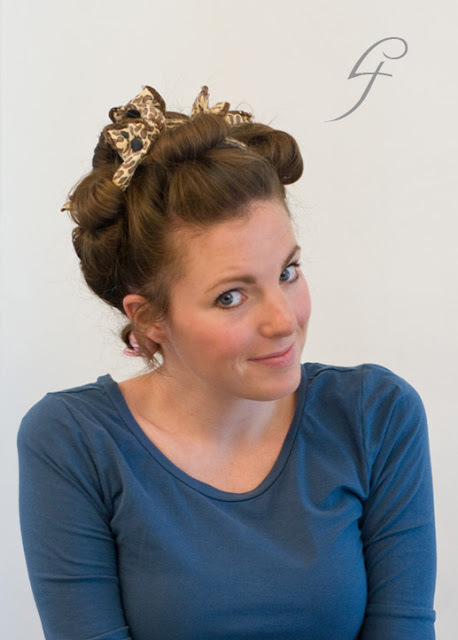 Make sure you've got all your hair up in rollers then sleep on it if you can. It's best to wrap your head in a scarf at this point to prevent the crazy frizzies that occur when your pillow attacks your hair in the night. Because I love you, I took a picture. Aaron is a lucky, lucky man. If you didn't think that far ahead, gently blow dry (through a cotton scarf, if you can. 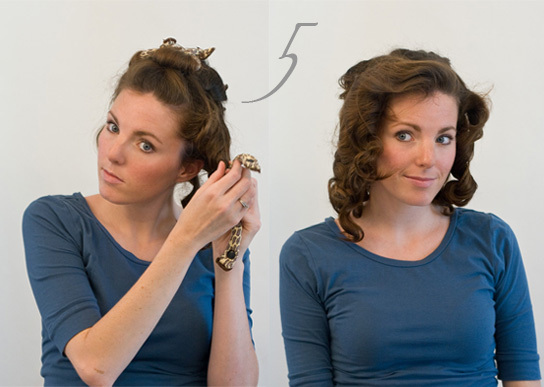 Again, to prevent the frizzies) then let your curls cool. The longer they sit in the rollers the better they're going to hold. 5. Gently pull out the rollers. It's going to be crazy curly. Like Shirley Temple curly. This is way looser than normal for me since I only left the curlers in for an hour or so after blow drying. Resist the temptation to run your fingers through the curls. They're easier to pin back when they're still chunky and the less you touch them the less frizz you will have to contend with. 6. 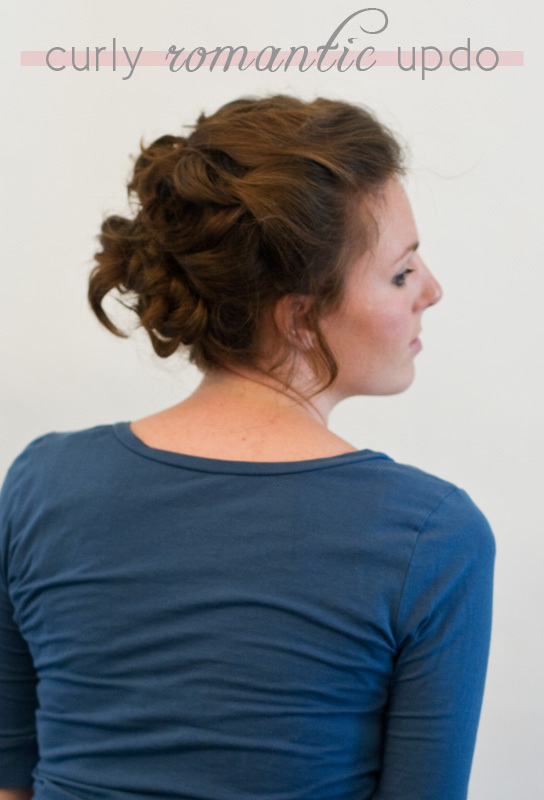 Bust out your bobby pins and start pinning the curls back. There's no rhyme or reason to it..I just aim for the middle back of my head. I try to tuck the ends in as I go but I like to leave a few loose. I usually leave the front section for last. 7. Use a mirror to check the back. 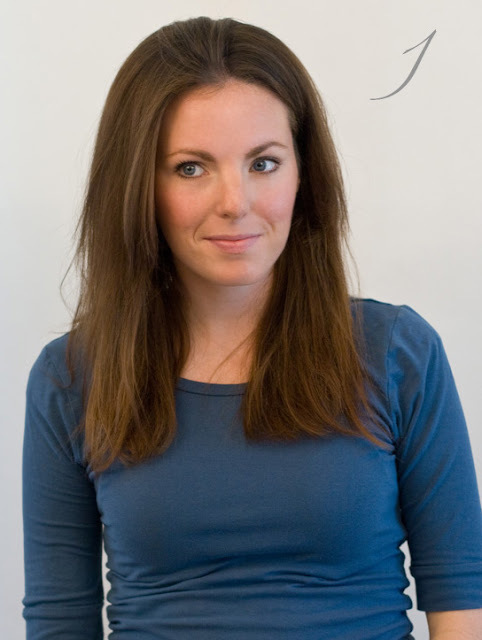 Reposition any wonky curls and you're done! *these are the ones I have. I've had them for over 10 years of fairly regular use and they're still holding up great. Very beautiful and very impressive how much effort you put into your hair (if it can't be done in 10 min or less, I don't do it). Also, thanks for calling my i-don't-want-to-wash-my-hair hairdo romantic. So sweet of you. Very pretty!! I'll have to give this one a try. I loved your jokes along the way too, you had me laughing! Ohhhhhh! Awesome! 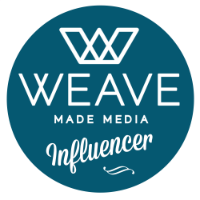 And um, I am so trying that sea salt spray. Beautiful!! This is so classy. Great tutorial! 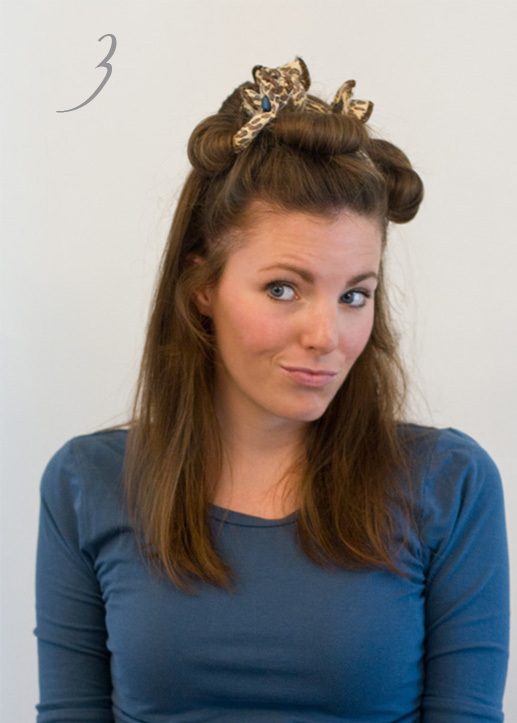 I seriously adore you, your leopard print curlers, and your AWESOME head scarf picture. Please be my friend forever. Thanks for the tutorial! I'll have to give this a shot. I have similar cloth rollers that I bought in college but I could never figure out how to make them work so they just sit unused under my sink. Now I know what I'm going to try with them! :) Thanks for the tutorial! Cannot wait to try this out! LOVEEEE! Good thing I don't have anything fancy for a couple months so I can give my hair a little time to grow.